Nintendo recently released some extra details from their official ‘Nintendo Console Gaming‘ Facebook page, on Donkey Kong Tropical Freeze’s online features. 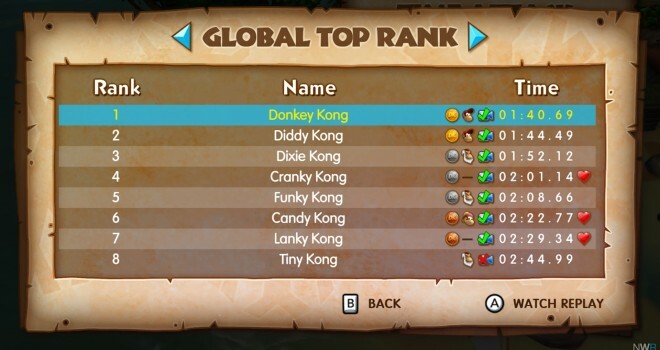 Donkey Kong Country: Tropical Freeze for Wii U will feature robust online leaderboards to track all your best times running, swinging and barrel-blasting through the game’s numerous levels. You can compete with friends and players around the world, and even upload videos of your fastest runs. The leaderboards will feature times, medal rankings, which Kong partner you played with and a heart icon that indicates if you beat the level without taking damage. Sounds pretty neat! Although there’s still a lack of multiplayer online, it will be nice to see what the speed-running pros can do. Normally I could care less about leaderboards, but being given the option to see HOW they got their score/time is always a nice treat!